Change happens. Change is good. Sours, stouts, lagers, pale ales, ciders and West Coast IPAs -we rotate them all. Give us a call to make sure what youre looking for is stil on the menu, to avoid disappointment. 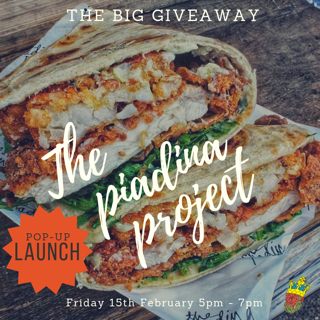 To celebrate Piadina Projects Kitchen Take-over, we’re celebrating with a launch, this Friday 15th -with free covers for the first 50 customers. These guys make all kinds of good stuff -fried chicken thigh, hash browns, burrata, wild rocket, pancetta, pickled cucumber, nduja mayo, grana Padanoall parcelled up in Italian flatbreads -the ones that Jack Padoan’s grandfather Gianni used to dream about from his adoptive home in Lincolnshire. You may have seen the queues at Victoria Park Market -well now you can find them here and eat, craft beer in hand, in the comfort of our cosy pub.